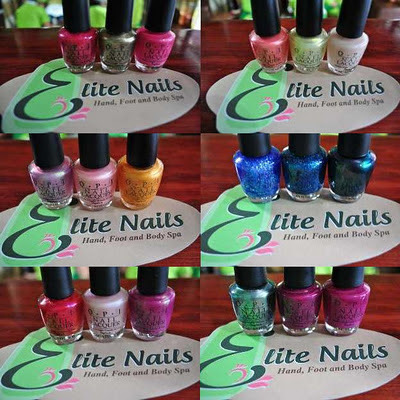 Elite Nails Hand, Foot and Body Spa: Elite Nails Spa welcomes OPI Nail Lacquers! Elite Nails Spa welcomes OPI Nail Lacquers! Join us as we welcome the brand with red carpet and confetti as OPI joins the family of Elite Nails’ fabulous nail polish collection. That is just so awesome! Here's to a lovelier nail paints soon to get you all in awe, we've already about a hundred variants (and still counting) and we just can't get enough of them and we'll keep 'em coming, that’s a promise! Why but these gorgeous and trendy lacquers are something every woman gets thrilled about. OPI's one of the best selling nail polish brands in the world. Every shade gives glow and makes the nails shine brighter because its color-rich, long lasting, chip-resistant and environment-friendly as it excludes DBP, toluene, and formaldehyde from its list of ingredients. Available shades of OPI lacquers can be seen at our facebook page and profile - Like Us on this Page! & Add Us as your friend! . Watch out for more additional collection coming very soon.